Andrew Wegman Bird (born July 11, 1973) is an American musician, songwriter, and multi-instrumentalist. He was initially known through his work with the band Squirrel Nut Zippers before forming Bowl of Fire, and is now best known as a solo musician. Bird's primary instrument is the violin, but he is also proficient at other instruments including whistling, guitar, and the glockenspiel. He wrote "The Whistling Caruso" for The Muppets and performed the whistling heard in both the film and the soundtrack. Bird composed the score for the FX series Baskets. Trained in the Suzuki method from the age of four, Bird graduated from Lake Forest High School in 1991 and Northwestern University with a bachelor's degree in violin performance in 1996. That same year he self-released his first solo album, Music of Hair. Vastly different from his later work, this album showcased his violin skills and paid tribute to his fascination with both American and European folk traditions, as well as jazz and blues. Following this, his initial commercial exposure came through collaborative work with the band Squirrel Nut Zippers, appearing on three of their albums (Hot, Sold Out, and Perennial Favorites) between 1996 and 1998. Taking on the role of bandleader, Bird released Thrills on Rykodisc in 1998 with his group Andrew Bird's Bowl of Fire, shortly followed by second album Oh! The Grandeur in 1999. Both albums were heavily influenced by traditional folk, pre-war jazz, and swing, with Bird relying on the violin as his primary musical instrument, as well as providing vocals along with his trademark verbose lyrics. The Bowl of Fire featured musicians from Bird's home town of Chicago, including Kevin O'Donnell, Joshua Hirsch, Nora O'Connor, Andy Hopkins, Jimmy Sutton, Colin Bunn, and Ryan Hembrey. 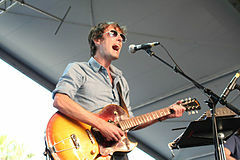 During this period, Andrew Bird was a member of the jazz group Kevin O'Donnells Quality Six, for which he was the lead singer and violinist and contributed to arrangements and songwriting for the albums Heretic Blues (Delmark 1999) and Control Freak (Delmark 2000) (both Delmark albums were produced by Raymond Salvatore Harmon). In 2001, the Bowl of Fire released their third album, The Swimming Hour, a dramatic departure from their previous recordings. It featured a mixture of styles, from the zydeco-influenced "Core and Rind" to more straightforward rock songs such as "11:11". Due to this eclectic nature, Bird has often referred to it as his "jukebox album". Although gaining critical praise (The Swimming Hour received a 9.0 from indie music website Pitchfork), the band failed to attain commercial success or recognition, playing to audiences as small as 40 people. In 2002, Bird was asked to open for a band in his hometown of Chicago, but fellow Bowl of Fire members were unavailable for the date. The reluctant Bird performed the gig alone, and the surprising success of this solo show suggested potential new directions for his music. The Bowl of Fire unofficially disbanded in 2003, and Bird went on to radically re-invent himself as a solo artist. His two subsequent albums were released on Ani Difranco's Righteous Babe Records label. 2003's Weather Systems (originally released on Grimsey Records) was a sparse record with a dramatic change in musical direction. It featured the tracks "Skin" and "I", proto-versions of songs that would later become "Skin, Is My" (The Mysterious Production of Eggs) and "Imitosis" (Armchair Apocrypha). The Mysterious Production of Eggs (2005) continued a progression towards an eclectic indie–folk sound, and both records formed a stark stylistic break with Bird's earlier work, swapping the lush backing of a full band for carefully layered samples of sound constructed using multitrack recorders and loop pedals. As his sound changed, Bird made increasing use of guitar, glockenspiel, and whistling in his songwriting, in addition to his traditional violin and vocals. Bird is noted for improvising and reworking his songs during live performance, as can be seen in his series of self-released live compilations entitled Fingerlings, Fingerlings 2, Fingerlings 3, and Fingerlings 4, the first of which was released in 2002. Each Fingerlings EP was released prior to a studio album, and presented a mixture of live performances from different shows, including old tracks, covers, and previously unreleased songs, some of which have since appeared on studio albums. Fingerlings 3, released in October 2006, also featured studio outtakes. Fingerlings 2 provided Bird with an unexpected boost in recognition in 2004 when it was named album of the month by Mojo. In 2005, co-collaborator Martin Dosh joined Bird's line-up, adding percussion and keyboards to his sound. Jeremy Ylvisaker was later added to the group on bass and backup vocals. In September 2006, Bird signed to Fat Possum Records, and in March 2007 he released his third post-Bowl of Fire album, Armchair Apocrypha. The album was recorded in collaboration with electronic musician Martin Dosh, and includes a track composed by Dosh (with lyrics by Bird) entitled "Simple X". This song first appeared without Bird's lyrics as "Simple Exercises" on Dosh's 2004 release Pure Trash. The album was produced by Ben Durrant (who had worked on Dosh's The Lost Take), and also featured Haley Bonar and Chris Morrissey. In advance of the March release date, Armchair Apocrypha was leaked to the Internet in January 2007. The album went on to sell over 100,000 copies. As publicity for Armchair Apocrypha, Bird made his network television debut on April 10, 2007, performing "Plasticities" (from the new album) on the Late Show with David Letterman. He also appeared on Late Night with Conan O'Brien on June 14, 2007, performing "Imitosis" from the same album. In April 2007, he did a Take-Away Show acoustic video session shot by Vincent Moon. These appearances were accompanied by an extensive tour, which ended with sell-out performances at the Beacon Theater, New York and the Orpheum Theater, Los Angeles. In January 2007, Bird made an appearance on the Noggin television network's Jack's Big Music Show, playing the part of Dr. Stringz and appearing in order to mend a character's broken dulcimer. Bird sang a brief song called "Dr. Stringz", written specially for the show. He now often plays it live as an introduction to the song "Fake Palindromes". On May 20, 2007, National Public Radio aired a live concert by Bird from Washington, D.C.'s 9:30 Club He also worked with Reverb, a non-profit environmental organization, for his 2007 spring tour. Five of his songs – "Banking on a Myth" from "The Mysterious Production of Eggs," a medley of "I" from Weather Systems and "Imitosis" from "Armchair Apocrypha," and "Skin" and "Weather Systems" from Weather Systems – have been licensed for use by Marriott Residence Inn. Since March 2008, Bird has contributed to "Measure for Measure," a New York Times blog in which musicians write about their songwriting process. In it, he has charted the development of the song "Oh No," previewing samples at various stages of development through to the finished album recording. He also discussed the conception of the song "Natural Disaster," the recording of instrumental piece "Hot Math," and previewed "Master Sigh." The first two songs were later released on Bird's 2009 album Noble Beast, whilst the latter two appeared on its bonus disc Useless Creatures. "Oh No" was featured in the show Billions. In November 2008, he appeared in the second series of Nigel Godrich's From the Basement alongside Radiohead and Fleet Foxes. His performance included a preview of new song "Section 8 City," a ten-minute re-imagining of "Sectionate City," which originally appeared on the Soldier on EP. Bird's fifth solo album, "Noble Beast," was released on January 20, 2009, and contained fourteen new songs, with bonus tracks available for download from iTunes and eMusic. "The Privateers" is a re-imagining of a very early song entitled "The Confession" from 1999's "Oh! The Grandeur." A limited deluxe edition of the album included alternate packaging and artwork, as well as an all-instrumental companion disc entitled "Useless Creatures." The entirety of "Useless Creatures" was made available via Bird's website during the run-up to the release. "Noble Beast" has been met with generally favourable reviews, receiving a score of 79 out of 100 from review collation site Metacritic. In 2009, he contributed a cover of the song "The Giant of Illinois" to the HIV and AIDS benefit album Dark Was the Night produced by the Red Hot Organization. On May 11, 2009, Bird released the EP "Fitz and the Dizzy Spells." It contains "Fitz and the Dizzyspells" from "Noble Beast," as well as other songs from that album's recording sessions. Some of the songs on the EP were previously available for download from iTunes and eMusic as bonus tracks to "Noble Beast." In 2010, Bird recorded with the Preservation Hall Jazz Band, contributing vocals and violin on a cover of "Shake It and Break It" on "Preservation: An Album to Benefit Preservation Hall & The Preservation Hall Music Outreach Program." In August 2010, Bird contributed a charity T-shirt to the Yellow Bird Project to raise money for the Pegasus Special Riders Fund, which provides therapeutic horse riding activities for adults and children with special needs. In late 2011 Bird signed to the record label Mom + Pop Music. Andrew Bird's first release for the label was the soundtrack to the film Norman, which included his original score as well as songs by other artists. Bird sequenced the soundtrack to flow as a stand-alone album rather than a compilation of music from the film. Its music supervisor, Peymon Maskan, told HitQuarters: "The best compliment I've heard is that without having seen the film, you can imagine it by listening to the soundtrack. The sequence is a big part of that effect." On December 6, Bird announced a new album Break it Yourself, the follow up to 2009's Noble Beast. In 2011 "Andrew Bird: Fever Year", a feature-length concert documentary on Bird's year-long tour, had its World Premiere at Lincoln Center with the prestigious New York Film Festival. The film's festival-only run closed in 2013 after screening in over ninety international festivals and winning nine awards. "Fever Year" depicts Bird and his band during final months of a tour during which he reportedly suffered from constant fever. When asked on her website if the film will be released on DVD, director Xan Aranda stated that the film was commissioned by and belongs to Bird, thus the release is up to him to decide. Andrew Bird: Fever Year also features Martin Dosh, Michael Lewis, Jeremy Ylvisaker, and St. Vincent (Annie Clark). In September 2012, Bird announced Hands Of Glory, a companion EP to Break it Yourself. The album was released on October 30. In 2014, Andrew Bird's song "Pulaski at Night" was featured in the second-season premiere episode of Orange Is the New Black. "Pulaski at Night" was also featured in the first season of Paolo Sorrentino's The Young Pope. On June 10, 2014, Andrew Bird released his album Things Are Really Great Here, Sort Of..., an album of covers of The Handsome Family and Bird's first record that does not contain any of his own compositions. Growing up, Bird was surrounded by classical music. As a child, he was interested in Irish tunes and bluegrass. He also cites English and Scottish folk music as an early influence. His early jazz influences were Johnny Hodges, Lester Young, and Fats Waller. He has also had a number of classical influences such as Claude Debussy, Maurice Ravel, and Béla Bartók. Other influences included jazz, swing, calypso, and folk. Bird has stated that, at 22, he found a lot of indie rock and pop music repetitive and boring, but now understands it better. Andrew Bird appears to have a close relationship with The Handsome Family, an Americana band from Illinois. Covers of their songs have appeared in several of his albums, including "When The Helicopter Comes," on Hands of Glory, "Tin Foiled," on Fingerlings 3, and "Don't Be Scared," from Weather Systems. His album Things Are Really Great Here, Sort Of... is a ten-song cover album, with a strong country feeling. The album's liner notes contain a response from Rennie Sparks, the band's lyricist and singer: "Hearing Andrew's version of our songs feels like suddenly spotting a new and shining doorway in the midst of a room I have spent my life in. It's like finding a stairway in the forest leading upward to the sky. His recasting of our work gives me the strange and wonderful pleasure of understanding my own songs better by hearing him perform them." ^ a b c d e f Andrew Bird. "Andrew Bird – Biography". Retrieved 2009-02-12. ^ Joe Tangari (December 31, 1999). "Andrew Bird's Bowl of Fire: The Swimming Hour". Pitchfork Media. Retrieved 2009-01-13. ^ a b Jonathan Mahler (January 2, 2009). "Andrew Bird Discovers his Inner Operatic Folkie". The New York Times. Retrieved 2009-01-13. ^ Kati Llewellyn (September 11, 2006). "Andrew Bird Signs to Fat Possum, Titles Record". Pitchfork Media. Retrieved 2006-09-11. ^ "Andrew Bird - Armchair Apocrypha". Discogs. Retrieved 2016-01-16. ^ "Andrew Bird Is Dr. Stringz". Stereogum. Retrieved 2016-01-16. ^ Klemons, Josh (February 20, 2009). "Andrew Bird, 9:30 Club, Washington, DC- 2/3". jambands.com. Retrieved 2016-01-16. ^ "Andrew Bird in Concert". NPR. May 20, 2007. Retrieved 2012-10-31. ^ Bahn, Christopher (March 13, 2007). "Andrew Bird". www.avclub.com. Retrieved 2016-01-16. ^ "Andrew Bird in Marriott Residence Inn spots". The Daily Swarm. July 2, 2007. Retrieved 2012-10-31. ^ "Posts published by Andrew Bird". The New York Times. ^ "Natural History". The New York Times. April 8, 2008. ^ Stosuy, Bradon (November 20, 2008). "Andrew Bird Plays A New Song In Nigel Godrich's Basement". Stereogum. Retrieved 2016-01-16. ^ "Andrew Bird - Soldier On". Discogs. Retrieved 2016-01-16. ^ "Andrew Bird: Noble Beast (2009):Reviews". MetaCritic.com. February 11, 2009. Retrieved 2009-02-11. ^ "Andrew Bird - Fitz And The Dizzyspells". Discogs. Retrieved 2016-01-16. ^ Breihan, Tom (September 20, 2010). "Andrew Bird Releases Instrumental Album, Tours". Pitchfork Media. Retrieved 2013-11-15. ^ a b c "Q&A on the music supervision for award-winning film 'Norman' with Peymon Maskan". HitQuarters. January 10, 2012. Retrieved February 2, 2012. ^ "Andrew Bird Announces New Album | News". Pitchfork. December 6, 2011. Retrieved 2012-10-31. ^ "About". Xan Aranda. Retrieved 2012-10-31. ^ Hudson, Alex (September 24, 2012). "Andrew Bird Details 'Hands of Glory,' Shares New Track • News •". Exclaim.ca. Retrieved 2012-10-31. ^ "The Official Website of". Andrew Bird. May 13, 2014. Retrieved 2014-07-13. ^ "Things Are Really Great Here, Sort Of... - Andrew Bird | Song Reviews, Credits | AllMusic". AllMusic. Retrieved 2015-12-08. ^ Wilkinson, Sue (August 19, 2009). "Andrew Bird's high-wire act takes flight". BBC News. Retrieved 2012-10-31. ^  Archived November 13, 2007, at the Wayback Machine. ^ astromark in Arts & Events (March 19, 2009). "Interview: Andrew Bird". Houstonist. Retrieved 2012-10-31. ^ "Interviews: Andrew Bird | Features". Pitchfork. May 22, 2007. Retrieved 2012-10-31. ^ Jessica Curry (February 18, 2009). "Ornithology: An Interview with Andrew Bird". Chicago Life. ^ Liner notes, Things Are Really Great Here, Sort Of..., 2014. ^ "Andrew Bird - Chart history - Billboard 200". Billboard. ^ "Andrew Bird - Chart history - Rock Albums". Billboard. ^ "Andrew Bird - Chart history - Folk Albums". Billboard. ^ "Andrew Bird". Dutch Charts. ^ "Andrew Bird". Official Charts Company. ^ a b c "Flying High". Billboard: 38. November 15, 2008. ^ "ANDREW BIRD to release 'Break It Yourself' in March 2012". Bella Union. December 8, 2011. ^ "Upcoming Releases". Hits Daily Double. HITS Digital Ventures. Archived from the original on March 4, 2016. ^ "Andrew Bird – I Want to See Pulaski at Night – Out Now!". Pulaskiatnight.andrewbird.net. Retrieved 2014-07-13. ^ "Music: Top 100 Songs | Billboard Hot 100 Chart". Billboard. Retrieved 2016-11-27. ^ Andria Spring (February 9, 2009). "Album Review: Loney, Dear – Dear John | Prefix". Prefixmag.com. Retrieved 2012-10-31.